Dr Richard Lerner has been doing a 2.5 year longitudinal study near his school of randomly selected 1800 scouts and 400 non-scouts. He started by studying the boys as the entered scouts. He was setting a benchmark as to whether scouting changes boys character. Dr. Lerner’s final report is out. The summary is available at Scouting Magazine’s website. So what about being solely focused on sports? Unfortunately, the sports-focused kids took a hit in how well the kids prioritize values, particularly in their priorities in caring for other people. 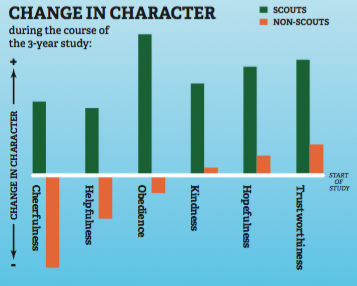 They are not as interested in other people’s well-being, as were scouts. This effect becomes more pronounced as the boys stayed in scouting. The BSA has quickly taken advantage of the good news of this report and created a flyer in a PDF that units can use. 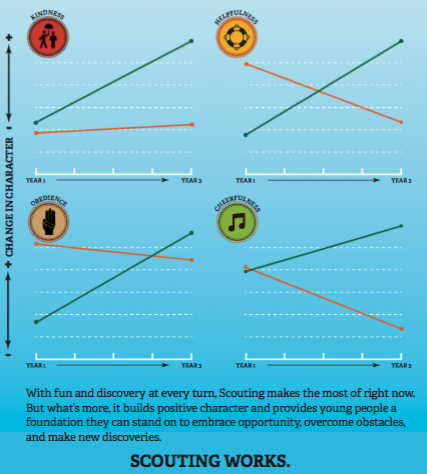 How can your unit use this information to spread scouting to new units and new scouting families? This entry was posted in Recruitment, Research, Why scouting?.